Home » Latest News » Rand-Air’s TwinPower generators do mines a ‘power’ of good! Fundamental to Rand-Air is the ethos of ultimate customer convenience. To this end, Rand-Air has purchased four Atlas Copco TwinPower generators, the benefit of this arrangement being that there are two 550 kVA generators in each container. This containerised generator solution gives a very compact footprint, unrivalled versatility, optimised performance and excellent fuel economy in demanding modular power plant (MPP) applications. In addition, the two modules inside the container can be synchronised so that it is possible to supply either 1100 kVA or 550 kVA – a versatile and portable cost- and fuel-saving option for the customer. “Many of our customers prefer to have one self-contained unit on site, as opposed to two individual 550 kVA generators in sync,” explains Rand-Air Fleet Manager Craig Swart. 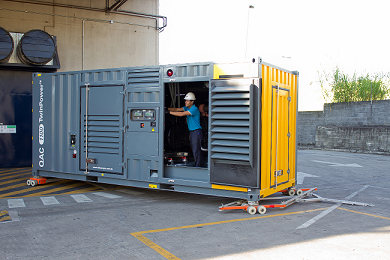 The footprint of the container is smaller than two individual 550 kVA generators; and having the generators in containers protects them against extreme weather conditions. The company is able to supply the TwinPower solution to a wide geographic area. “We have our headquarters in Johannesburg; as well as depots, branches and substantial representation across Southern Africa. We are also able to supply and service our neighbouring sub-Saharan African countries from South Africa,” continues Swart. On the question of whether the new generators will meet contemporary power needs and challenges, he explains that Rand-Air generators definitely have an important application, and are not only hired by mines, petrochemical and other industrial customers, but also by organisations such as municipalities or power utilities. This generally occurs in instances where the regular mains power supply is out of action for some considerable period, or where there might be concerns about the consistency of supply from the national grid. “Our TwinPower units offer for example mining operations considerable versatility as we can synchronise a number of our containerised units to provide sufficient power for even a major mining operation,” he continues, adding that having this option would give a mine that all-important peace of mind. Rand-Air’s turnkey solution furthermore relieves its long-term rental customers of the concern about finding suitable temporary power. The units are delivered to site and Rand-Air technicians make sure they are working to the customer’s complete satisfaction. “All the customer needs to do is switch the power on, and continue uninterrupted with their core business,” he continues. “While there may be hundreds of rental generators in the hire market, if you are looking for an absolutely reliable, versatile source of power – apart from our excellent products and technology – it would have to be found in Rand-Air’s unmatched technology, customer service and technical support,” he asserts. Regarding the company’s knowledge of the mining industry, for more than four decades, Rand-Air has built up considerable expertise and experience in supplying mines with temporary power (and compressed air), particularly for critical mine shut-down operations. Rand-Air is aware of the critical nature of supplying the right size and the correct level of service backup too, which is available 24/7/365. “A further benefit that mines receive when dealing with Rand-Air is that, with our long experience, we have a very good working knowledge of the various mines’ safety requirements; and are therefore able to fully comply with these,” he elaborates. In fact, Rand-Air has its own in-house Safety Health Environment and Quality (SHEQ) Manager, who ensures that SHEQ compliance meets all required standards. “In our dealings with mines, Rand-Air has increasingly noted that they want to deal with suppliers which are able to effectively mitigate any operational or SHEQ-related risk,” Swart emphasises. Proof of the efficacy of Rand-Air’s service to mines lies in the fact that it has had repeat business many times from mines of all types, including gold, platinum and coal. “Recently, one of our platinum mining clients had a two-day shut-down. Rand-Air was able to provide this customer with a successful and trouble-free temporary power solution. We are extremely gratified by this repeat business, as it indicates that when mines think temporary power, Rand-Air is first in mind,” he asserts. In an emergency, where a mine might need replacement power generation immediately, Rand-Air is able to respond very promptly to customer emergencies. “We will either supply from our own fleet and, if that is not possible, we are able to source temporary air or power from other highly reliable sources at short notice,” continues Swart. “Rand-Air’s introduction of the new TwinPower containerised generators will give our mining customers – particularly those in remote locations – the peace of mind and convenience of having reliable, versatile temporary power just a phone call away,” he says in conclusion.